Julia Lloyd is a Master of Public Health Student with a concentration in Nutrition and previously served as a graduate assistant in the Family and Consumer Sciences department. 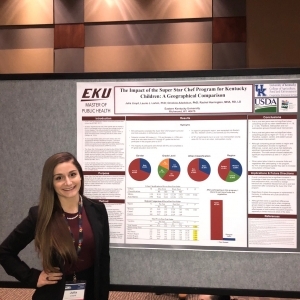 Julia is from Feeding Hills, MA and received her undergraduate degree in Dietetics from the University of Kentucky. Effective July 1, 2017, the Graduate School will only accept entrance exam (GRE, GMAT, MAT) scores that fall within five years of the test date. TOEFL results will only be accepted two years after the prospective student took the exam.